Recommended articles seem to not have been updated in multiple years, so here I am. My room SNR is 32db thanks to my loud computer and untreated walls, latter is being taken care of when I move soon, but I need some help with the PC. Currently, I use two SSDs, a 7850 (inaudible over the other components), an FX 4150, a rosewill capstone 450 (4 years old), a zalman CPU cooler I forget the name of which has developed a slight clicking problem over the 4 years I've had it along with a hum, and an untreated folds-and-rivets thin SECC case from 2004 (front panel half-missing, side panel missing). I've identified that the loudest parts are the power supply and CPU cooler, and this is worsened by the open and echoey case. I'm looking for solutions ranging from things I can do temporarily right now, to permanent solutions that I'll have to save up for. Any more suggestions and any suggestions for things to choose for the above options are asked for, and yes I am completely fine with saving up for a water loop and dealing with cleaning it regularly if pump noise is not still an issue. I infer from your comments that this PC is used in a live mic environment? Maybe you could detail your applications and s/w so we could provide better answers. 1) What's your budget for now and future? (Best way to prioritize fixes). 3) Why are the case panels missing? 4) Are you having any temperature/throttling problems? 5) What's the make and model of your motherboard and CPU cooler? Liquid cooling is seldom a better path for an inaudible PC. I think you meant SPL rather than SNR If the zalman cooler looks like it has the capability to cool your 95W CPU, then maybe a fan replacement will solve your clicking/humming problem. 1) Budget is "up to" $180 per month. This is inflexible upwards but likely to change per month downwards. 5) Motherboard I have no idea, it's an ASRock AM3+ mobo with a low-end late AM3+ chipset on it though, and the CPU cooler is a Zalman CNPS5X. I need more ideas, though, such as a new case to buy, cheap temporary options etc. Also you are correct; this PC is used as a recording console for a small studio, as well as a light gaming machine, as I live in a single room so there's not much point to separating the recording console and gaming computer when they both need the same CPU power and I don't have $600 on a second computer. 1) Get a new case. One of the primary purpose of a fanned case is to move air through it and to remove heat build up around the CPU/GPU. So, your current noisy cooler isn't getting the benefit of this airflow...and while it won'tr solve the cpu cooler problem, it'll help in the long term. If you don't need an internal Optical drive, the Fractal Design Define C is a good fit. I don't know what their shipping costs are, but Direct Canada has it on sale for $77. Another is the Fractal Define S (which comes with 140mm fans vs the 120mm of the C) for $85. And if you need the internal ODD slot, the Fractal Define R5 is a great case. 2) Get a new cooler. Normally, I'd suggest a Scythe, but their distribution in Canada is...poor. Arctic A32: I like that a PWM signal of <40% can turn the fan off for your recording sessions (where the CPU load is pretty light)..although many current gen mobo's can do the same. I don't like that it only comes with AMD mounting...as you may be in the market for a new cpu/mobo down the road and it limits you as it won't work with the new AMD AM4 socket or any Intel. Check out the Cryorg H7 or the be quiet! Pure Rock. The former is a better performer for $47, the latter is cheaper for $31....these will fit in the Fractal cases...don't know the height restriction of your current case. 3) Get a new PSU. A lot of the current gen PSUs are semi-passive designs and when on with heavy loads, you won't hear them over the gfx card. Again distribution/pricing in Canada seems lacking for some go-to models.. EVGA G2 550: is pretty good. Fan will turn on with ~125W load. There's also the G3 version. I'd rather spend $115 on the Corsair RMx550. While your HD 7850 might not be heard at the moment, it's always on fans may become noticable after you've solved the above issues. Just to compare the fairly old 7850 with the current gen of cards, the RX 560 and GTX 1050 both provide more oomph for much less power use and the cards we'd recommend have passive fans for low loads (all 2D stuff/recording, etc). I'll probably get the Define C. Any recommendations for fans, or are the fans in this case quiet enough? I'll go for the cryorig cooler. I'll be ordering the case and cooler on one order so it doesn't matter if it fits the current case. Noted, might go for the RMx550, though it depends on how the budget is for that month. Oh, I can hear the 7850 a little bit at high GPU load, also I have a way to turn off the GPU fan but it's not a great idea with the higher load of this GPU. GPU I will only replace if I can't get the SNR at my mic above the 50dB mark with everything else I plan on doing, since it plays all of my games at 75 FPS just fine. How about things for case treatment? Do people still foam cases? If so, how effective is it, and how much would it cost to do one mid-tower's worth of foam? How should I treat the corner the computer sits in? Would curtaining the wall suffice, or would I need to dislocate the desk from the wall and foam the wall behind it to get any noticeable effect of the treatment? Also, is this also a good place to talk about EMI noise? I get a large amount of that too at my desk, mostly from the keyboard (bass guitar pointed at the desk picks up the keypresses louder than any other EMI noise in the room, and the EMI noise is really high when the keyboard is plugged in) and visual monitors (turning off monitors seems to reduce EMI noise, but not as much as unplugging the keyboard). If so, what are some recommended keyboards and monitors for establishing a low-EMI environment? I don't currently (and will not in the future) have room to move away from the desk while recording electrical instruments, and while I'm already looking at purchasing pickups for the bass specifically that do not react as much to EMI, I would still like to reduce it if possible. No need for foam/etc. 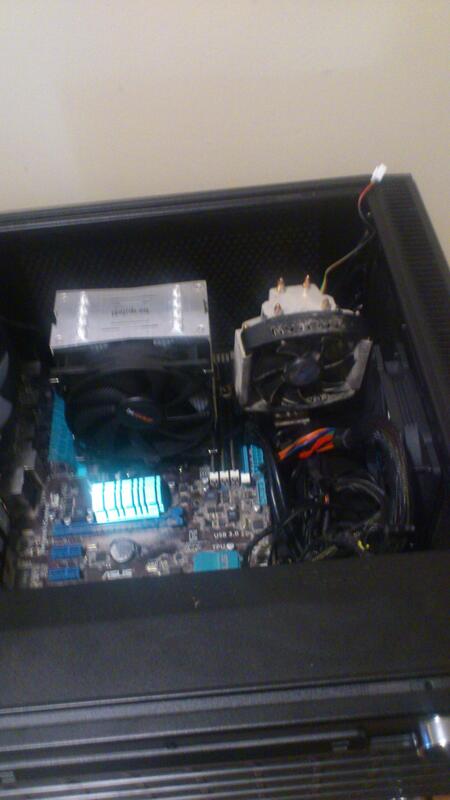 When you go with a well ventilated case and quiet components, it solves the noise issues. Typically, foam does nothing, anyway. Audio frequency wavelengths are too long for foam to significantly reduce the noise levels - note how thick studio foamboards are and now try to put that in your PC Sometimes, if there is a vibration component (spinning HDD) and a flimsy case, adding mass loaded vinyl tiles to case sides can reduce the induced vibration. Not a problem for your use case. As for where the PC sits...again, lets try it as is. Best place is for the PC to sit on the floor - preferably a hard surface for bottom airflow. EMI: Wow. You are freaking me out. - Your bass is picking up the keyboard polling? What does it sound like? - Is all this stuff plugged into the same wall socket? Do you get the same effect if there were a laptop (not plugged into wall) instead of your desktop? - Have you ever tested your wall socket to make sure it's wired correctly/has good ground/earthing? - My bass is picking up a very thin buzzing which is not affected by the volume knob but is affected by the tone knob and interface preamp, and when I press the keys on the keyboard while facing the keyboard with the bass it picks up a sharp ticking for every keypress. Note: keyboard is a model m from 1986, not quite fit for the studio setting. - Wall socket is definitely bad, but I'm moving soon and the new place has good wiring. You can drop into the rabbit hole when discussing EMI/RFI issues. Could be a miswired wall socket (reversed power and neutral, bad ground), could be PC EMI leaking via the keyboard...but I've never heard of this...monitor backlight circuitry can generate audible and RFI noise...possibly coupling with your bass' pickup. Need to fault isolate stuff to see what the triggers are...but, if you are moving soon and don't want to see if it's the wall socket or something else, ok. I'll definitely check the wall sockets if it persists when I move. On the case of audible noise, I was just able to order the Define C just now but not a cooler with it. I'll be purchasing one of the coolers in not too long, but for now I hope the case alone causes enough of an audible noise decrease for at least test recordings. I expect moving to a case with fans will help with the temperatures, which should reduce the noise. EDIT: I just realized I have a wireless gaming controller that I frequently leave on while recording, I'll try turning it off and recording and see how much of an effect it has on the EMI noise. ordered the bequiet cooler recommended to me, and talked with some keyboard folks about keyboard EMI. apparently a very common issue with high-voltage keyboards like my own, and circumventable by using a low-voltage and/or high polling-rate keyboard, as I suspected before. Both the cooler and case will be here next week, since for some reason they are coming from the literal other side of the country. Yeah, this makes no sense. Keyboard supply voltage is 5V for both PS/2 and newer USB. There is no high voltage or low voltage involved. A wireless Model M, that would be something. keyboard is wired, and other keyboard collectors have noted similar issues with their early model ms.
sorry for double posting twice, case got here and I installed the computer into it. aside from being kinkin "new case, no post" kijkin, it's increased the SNR at my mic to 45 from the previous 32, and improved cooling, so I'm already liking it. Cooler hasn't shipped yet. If your s/w can measure SNR, can it also provide a dB vs frequency graph? It would be interesting to see the frequency components. unfortunately I did the SNR calculation by hand using a dB meter. To note: I did this in windows, which doesn't let me solo my mic input from my guitar input on my interface, so there's a -52db noise floor from the guitar preamp. I don't have software to measure dB in realtime in linux, even though I have a fairly complex setup in linux. If I could boot into linux right now I could get some frequency graphs, but I'm doing some temperature testing which I can only do in windows. I'll probably get a noise recording tomorrow when everyone in the house is gone (I got my current SNR reading with my door open and my mother watching TV down the hallway, sister yelling at her boyfriend occasionally from across the house, was an annoying calculation to make and is probably not accurate). EDIT: GPU is seeing immense temperatures at load... I almost fried it just now in temp testing. Oops. EDIT MORE: Cleaned GPU and now the whole system is running cooler, so I went and tanked the gpu fan curve so that it is pretty much off if the computer isn't at load. Well, surprise be to me, my gpu's ticking too now, just at low speeds. great at least it's not audible with the case closed. well, as said before, I'm moving soon, and my new place will be much quieter, much better for recording. also, it seems after some cleaning and temp testing that the cpu cooler didn't quite need to be replaced yet, except for the clicking, but I'm moving soon and need to have this money on hand so... oops, I guess. cooler is here. Much quieter. It's a nice hunk of metal for $31 CAN. So, what's next, now that you've gotten above your goal of 50dB? well, I can still hear it, since the GPU is fairly loud, so I'll be replacing that, and the PSU is still loud, so I'll replace that too. EMI issues persist but I've switched keyboards temporarily (packed up the big one for moving) and the issues went mostly away, so I'm definitely getting a new keyboard specifically for recording. The guy who I got the keyboard from said he realized he forgot to finish the shielding when rebuilding it for me, but it wouldn't have made an absolute difference just due to how electrically-loud the keyboard is. but for now, I need my money for moving, so I don't expect to say much more other than comment on the noise of the new place and make remarks about reviews around here until I am done with moving fees. The CPU could be a problem. The AMD FX line is notorious power inefficient. The CPU is thermally rated for 95w and only uses up to 70w at full load, I'll be fine while I'm still using this processor. under 60°c, the fans turn off. it idles around 50°c in my case with a room temperature of about 20°c. fans are not audible above the vent noise in my apartment when they turn on. very happy with this GPU. What's the SNR up to now?